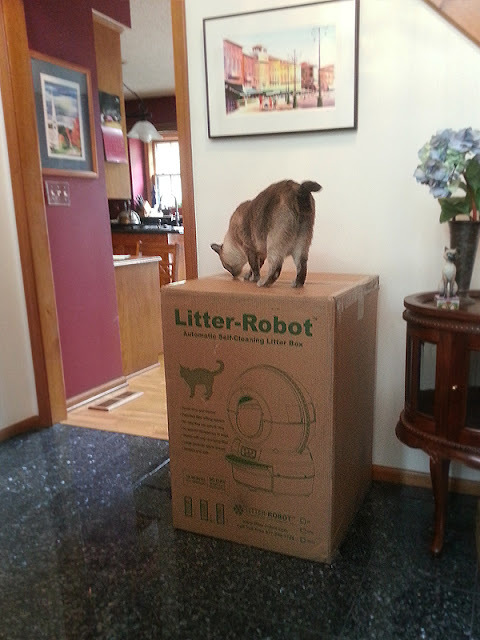 Over a month ago, we received a delivery from Litter Robot (and when I say delivery I mean ginormous Monster Box that any cat would envy!). 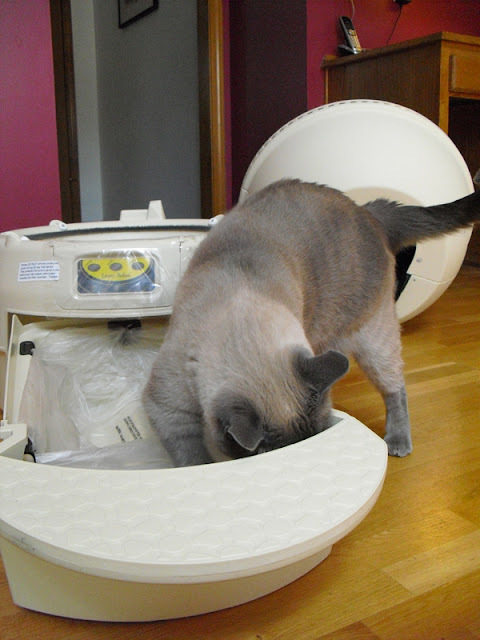 If you’re not familiar with the product, the Litter Robot is an automated litter box invented by a mechanical engineer named Brad Baxter who was frustrated with the ineffectiveness of automated litter products on the market. 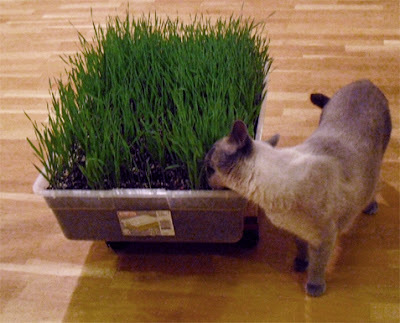 So he started noodling around with ideas of his own and in 2000, the first Litter Robot debuted. We like that it’s 100% made in America – assembled in Wisconsin, in fact. This 12-year-old company has a good track record with its customers, boasting a low 5% return rate. Once we got the unit up and running, we can see why. It is well engineered. But will the cats use it? We promised to give an honest review of their product, and so we took our time. That way, all three cats had ample opportunity to explore, get comfortable and report back on it. Today, we present to you their findings in the form of a photo diary with commentary. Loads of sniffing and snoopervising during this process, from all three – though Faraday kept a healthy and wary distance! The unit they sent us was easy to assemble. 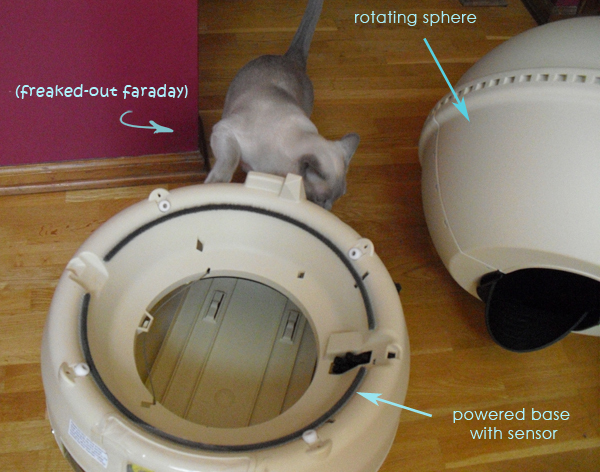 It basically had three main sections: the base unit, the spherical litter area (the part that rotates), and the drawer that the waste is dumped into. Here you see Maxwell supervising the installation of the plastic liner that lines the drawer. But of course, he had to check...! The unit comes with a small number of plastic liners to get you started, but the supply is easily replaced, as the liners are the same size as a standard 16 gallon trash bag. The liners are installed by pressing the plastic into the rubber grommets in each of the four corners. They'll hold the liner in snugly. I've had no issues at all with the liner pulling out when it shouldn't. Our unit came with a viewing port in the back. 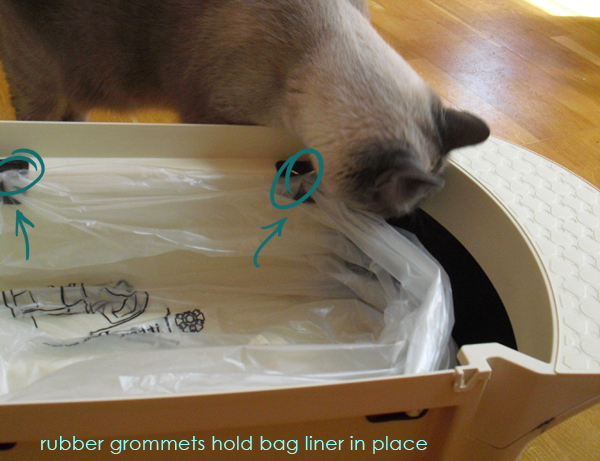 Maxwell thought this was totally rad and wanted to know if this was how kitties used the litterbox in space...? 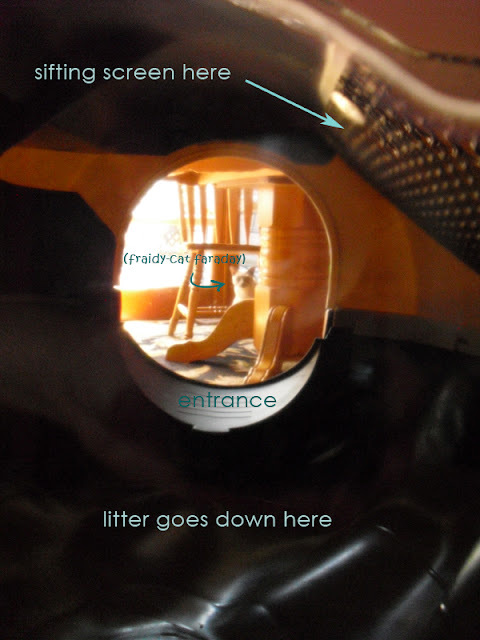 Here's what the inside of the unit looks like - the litter sits in a heavy-duty rubber sling at the bottom. The entire spherical top unit rotates, allowing the litter to be sifted and the solid waste to drop down to be collected in the drawer inset into the base, below. Day 3: The Big Move. I set the unit kitty-corner to their existing litter boxes, under the basement stairs. The company recommends that you replace existing litterboxes with this one but with Faraday being as opinionated and stubborn as he is - (remind us some day to post the video of him trying to use the bathroom SINK, oy!) - we didn't dare. Besides, the rule of thumb is to have one more litter box than you have cats - and since we have 3 cats, that means 4 litter boxes. The unit works with standard clumping litter - including biodegradable corn based litters, like the one we use: World's Best. "Wait! Is that...LITTER in there???" Loads of sniffing ensued, with Maxwell spending a bit longer time investigating than the other two. 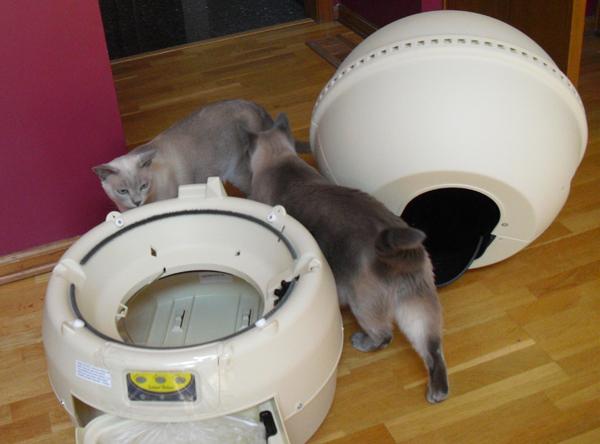 I placed a lump of used litter inside the Litter Robot to signal to the cats that yes, this is a litter box. Do you see the shelf that Maxie's standing on? That serves as the drawer handle and also the sensor-activation spot. 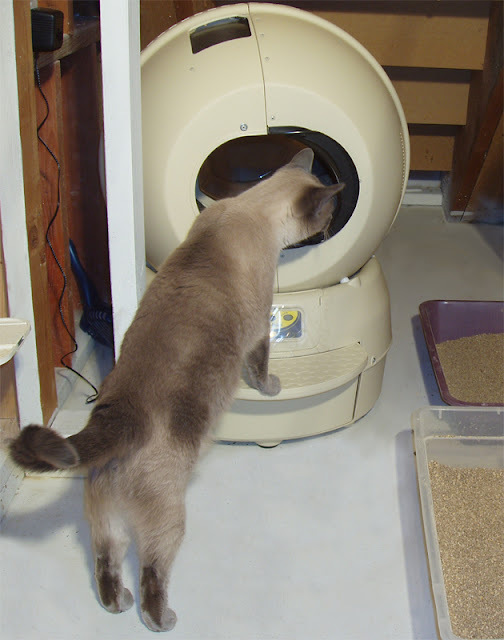 Max triggered the Litter Robot 7 minutes ago, when he went in. In this shot here, the Litter Robot has just started its automatic cycle, which drew him back to investigate. Nothing. No surprise there, really - as hackles were raised a bit on both Faraday and Allie when they saw it intruding in their bathroom. When I went down to clean litter, Max went with me. I held my breath and stood stock-still as he approached it. He went in! 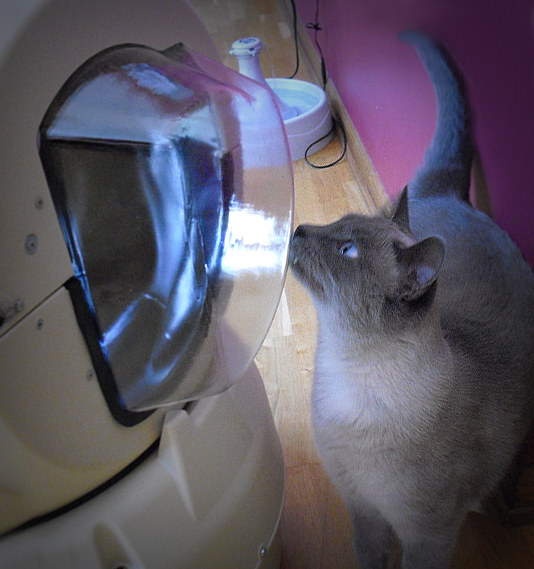 (Sorry no photos of Maxwell with the Wall Street Journal inside the Litter Robot). Looks like this is going to be the Men's Room! And - knowing Allie as we do... fastidious, energetic litter bury-er, plus she's larger than both boys too (Allie: I'm JUST BIG BONED!!) ... the Litter Robot may just be a bit cramped for her style. The Litter Robot definitely made it easier on Marty while I was away. And the boys had nice, clean litter without any effort on Marty's part! The Litter Robot is a perfect solution for a one-cat household, especially if its humans take short trips from time to time. It is a bit pricey - this unit retails for around $350 - and we probably wouldn't have purchased it for our own use simply because we have three cats, and one Litter Robot isn't enough for our needs. But are we glad we have it? You bet. And it definitely makes Marty's job easier while I'm away. Oh...and the fourth litter box we no longer need? It's been - as Miss Moderncat would say - upcycled. Very interesting litter box. But great review. You covered everything. I don't think that is for us though especially with that kind of price. But I bet a lot of people would be interested especially those that go out of town a lot. Pee Ess - hope you kittehz got to keep that great box it came in! Excellent review. We think that would be great for a single cat family too....we don't know anyone who only has one cat though!!!! Great review. Have a super Sunday. That's a very well written review. I'm not sure if I'll trade the litter boxes for a Litter Robot. I like scooping poop. HAH! Thanks for the thorough review! We have considered that thing, but I might be too skerred to use it. Um, No. That is all. I do not wish anything loud and mechanical in my litter box. I don't even approve of the Human Litter Box flushing. I think digging and scooping would be much better all around. Thanks for your thorough review ! We think it would be a bit cramped for us as we are 16 and 19lbs. We prefer to use the greenhouse too, although mum doesn't appreciate having to keep scooping it. That's a great review. We don't think this would be good for us, though, because we don't like covered boxes. Hmmm, it doesn't get pee & poop all over the sides as it turns? We would pass on this. What if no one liked it? Its a lot of money just to find that out. Great review. It seems scarey to us though. We prefer ta have TBT clean our boxes. What if that machine grabbed US after someone else just used the box? I certainly wouldn't use it! I just started using the 360 fountain that's been sitting there 6 months. I had a different automated litter box and it once went off as a kitty was walking toward it to use it. Freaked them out and wouldn't go near it again. I agree that automated boxes would work well for one maybe two cats, but after that I think they are more of a problem. I'm glad it worked out so well for you. I've neard nothing but positive reviews about this particular box. I'm not a big fan of electronic litter boxes - we have one and Binga and Boodie use it, but I only use the sift-and-lift litter pan - so I probably wouldn't care much for it. Plus I am so close to 5 lbs., it might not even work for me! Interesting review, though! Hmmm, with me being very close to 5 pounds and Kozmo being over 15 it would not work in our house. He still is unsure of the new Cat Ruler of the World Litterbox!